A little more than a week ago I was in my local HD to get some sandpaper and saw that they had two new Ridgid 15” drill presses marked down to $150. With my military discount, they would sell it to me for $135. I had been thinking about a drill press though not too seriously but this was a price that was just too good to pass up so I got one. Set up wasn’t too difficult but there were a couple of minor issues. I’m not crazy about the gear track for the table height adjustment. As you can see in the pictures, the process of setting the chuck in accordance with the instructions caused mine to bow. It doesn’t affect operation but it ain’t right either and that sort of bothers me. There was also a problem with the process of aligning the pulleys that was primarily caused by bad instructions. The instructions tell you to check if the pulleys are co-planar and if not, adjust by loosening the motor mounts and raising or lowering the motor. When I did so, I discovered that I couldn’t raise the motor high enough to make the pulleys align without the motor contacting the shroud. Further inspection revealed that the problem wasn’t the motor mount at all but rather that the allen screw holding the pulley to the motor shaft was loose and the pulley had slid down on the shaft. Simply loosening the allen screw and adjusting the pulley on the shaft is a much more effective and easier means of fixing the issue than trying to wrestle the entire motor assembly. Finally, the built in lamp requires an appliance bulb (smaller than std bulb) but nothing in the instructions tells you that. Other than those minor issues, the tool performs well. Speed is adjusted by re-positioning belts on the pulleys (the same as most of us older guys grew up with) but the process for doing so is easy and a chart affixed to the inside of the lid ensures you always know which combinations to use. It provides a 3 ½” quill travel which is about right for this class of drill press and adequate for most jobs. With the money I saved on the initial purchase, I was able to afford a couple of upgrades. 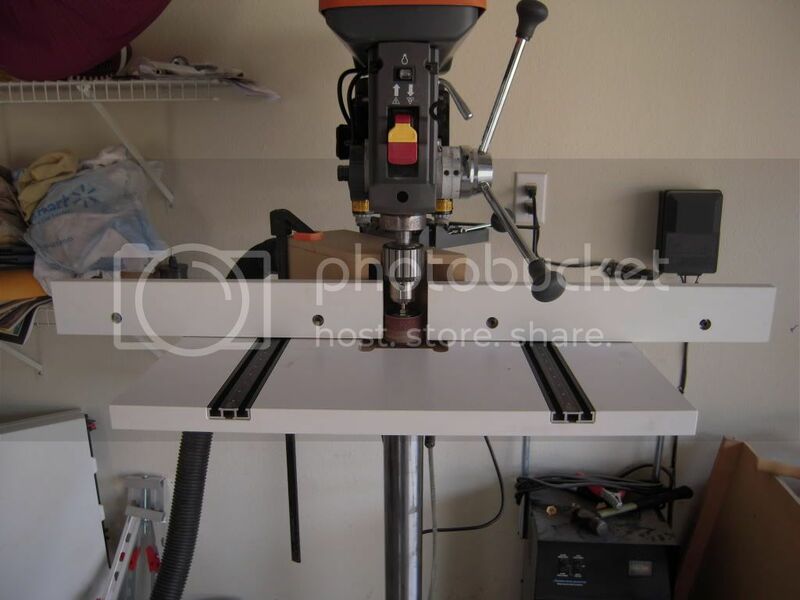 I purchased a drill press laser and a Pinnacle table from Woodcraft. The laser assembly attached and aligned easily with the included alignment pin. I think you can see from the photo that the laser produces a set of cross hairs that are easy to see. While I know that I could have built my own drill press table but I already have a backlog of projects and I’m really happy with the Pinnacle table. While its fence doesn’t lend itself to doing work on edge, (I’m sure that I will build my own tall fence to supplement this one) I like the etched rules on the rails it does have and a taller fence would interfere with the laser on boards lying flat. Zeroing the rules was a piece of cake since I had already attached the laser. One other thing that I like about the Pinnacle is that the t-tracks screwed all the way through the table rather than just into the particleboard like some tables do. This allows greater pressure on the clamps without the danger of pulling up the t-tracks. The replaceable MDF inserts provide ability to back all drilling or surround sanding drums. All together, I’m pretty durn happy with the total system that I was able to put together for a price less than $300. Sounds like a good deal for that price, drill press is next on my list after i finish paying off my table saw. Great deal. I paid full price for mine. yeah, I hope that I’m better at woodworking than with computers. I don’t know if it has something to do with my using a Mac but whenever I upload photos that are in portrait on my computer, they always revert to landscape when I upload them to this site. I just finished assembling one of these that I got for $126 after using a 20% Harbor Freight coupon. Did you have the table locked when you set the chuck? I don’t think mine budged. No issues assembling and found the instructions simple and clear. My neighbor helped lift the head onto the post. No way would I try it alone. I used a regular CFL bulb nothing special. It will poke out a little but CFL’s don’t get hot. I was surprised it fit though. I haven’t used it on a project yet, but so far it’s the best and biggest bang for my buck to date. This thing will always be worth what I paid. I was surprised how big and heavy this thing is. I might have to look into a mobile base. This is a best buy along with the 14” band saw that is also half off. If anyone is looking for these, not all HD’s are clearing them out. You need to check different stores if yours is still regular price. Good find and score on the DP and the upgrades, Greg. The DP is a pleasure to use and one of the most versatile in the shop. Don’t know what, if anything, may happen but it’ll be interesting to see if Emerson Electric and HD can keep the high value Ridgid line of large power tools in HD …Keep orange in orange. Nice review. I have the same issues with it you do and I also like the value to price ratio too. Check out my shop pictures and you will see it is mosty orange tools in there. Like a Ridgid comercial. I was in HD the other day looking at the same drill press. I am buying one, but not sure if the Rigid is the one. I am also looking at the Delta brand. I have a table top Delta now and like it. I believe the Delta would be about $70 more than the Rigid here in the Islands, and of course that is full price. If any of you have the newer Delta, drop me a line and let me know how you like it. I went ahead and built a taller split fence to use for drum sanding or whenever I need to drill a board on edge rather than in the face. The fence is just 2×2 aluminum 90 degree angle stock (notched for the sanding drum) with 3/4 melamine faces. Even testing it for a few minutes made it clear that dust collection was going to be a requirement so I threw together a collection box. It’s angled at 40 degrees to clear the column and works like a champ. Hey there Sir i Had the SAME problem with the Track Bowing They sent me a new one No Questions Asked! Give them a call! UPDATE: as recommended by jp93274, I e-mailed the Ridgid customer service dept via their website. No other contact was necessary and within a week they had a replacement table height adjust track shipped to my door by Fedex. Gotta love that kind of service. Picked one up Thursday evening at our local HD. After my 20% off Harbor Freight coupon I walked out the door paying only $65.85 for it. It was on clearance. True, it might not be the “best” DP out there but I have come to two conclusions: 1) for the the price it cannot be beat. One would pay more for a bench top model. 2) If I waited until I purchased the “best” I would never get any tools. We probably had it together in an more or less an hour. Now just need to get a table for it…or build one.